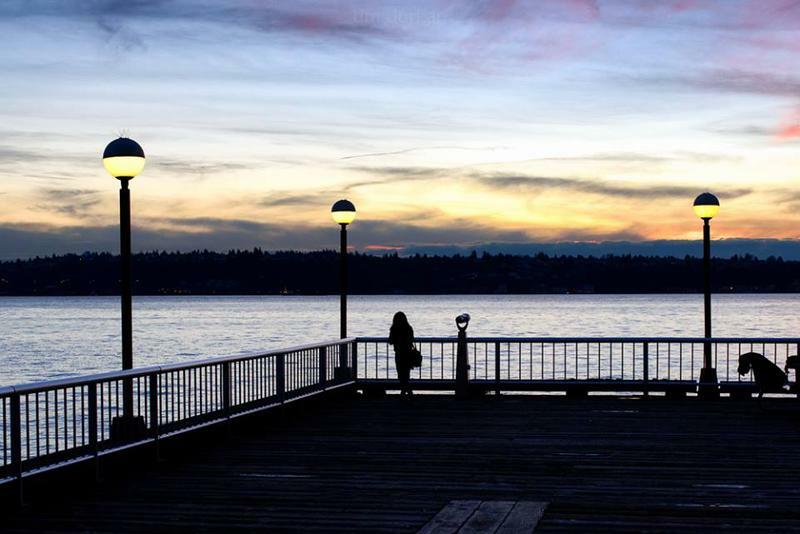 A Seattle pier on the waterfront of Eliott Bay, looking west, Jan 6th, 2016. What do mid-winter doldrums in western Washington, gunky skies east of us and the extremely wet weather to the south have in common? All are connected to the very strong El Niño that still reigns over the weather systems that are dousing California and keeping skies over the Cascadia region mostly dry and “very boring” according to KPLU weather expert Cliff Mass. There’s a stable pattern in place that will keep blue skies intact for much of the weekend west of the Cascade Mountains. It will also be dry, with just a few clouds floating around. On Friday morning, residual clouds are expected to yield to afternoon sunshine, with temperatures getting up into the mid-40s. And that kind of thing is pretty much what to expect for the rest of the weekend and into early next week. So while western Washington and much of Oregon are in those mid-winter doldrums, British Columbia, Alaska and California are getting the brunt of the jet stream from the Pacific that comes in like a fire hose and gets pushed around at the coast, depending on other factors, such as ridges and troughs of air pressure. “And we’re kind of left with the remains and there’s not much,” Mass says, regarding the mid-winter pattern that has just begun. On Saturday, Mass says there is one weak system that will be plummeting to the south of us, so there may be a few showers on the coast. “South of Olympia, down to Portland, maybe a few but it should be dry from Olympia northward and probably partly cloudy during the afternoon,” he says. On Sunday, a ridge of high pressure will develop over the region, Mass predicts, causing him to expect completely dry skies and maybe a few morning clouds that will break up into partial sunshine in the afternoon and temperatures still remaining in the mid-40s. On Monday, another “weak, splitting system occurs” Mass says, bringing bits of rain to the coast and to the south part of our region, but he says it will be generally dry over the bulk of Washington state. “So we are in a totally boring pattern,” Mass says. And you can blame that very powerful masculine weather pattern that remains in place. The current El Niño is extremely powerful - it's one of the strongest seen in the past 50 years. The weekly KPLU feature "Weather with Cliff Mass" airs every Friday at 9 a.m. immediately following BirdNote, and twice on Friday afternoons during All Things Considered. The feature is hosted by KPLU Environment Reporter Bellamy Pailthorp. Cliff Mass is a University of Washington professor of atmospheric sciences, a renowned Seattle weather prognosticator, and a popular weather blogger. You can also subscribe to a podcast of “Weather with Cliff Mass” shows.